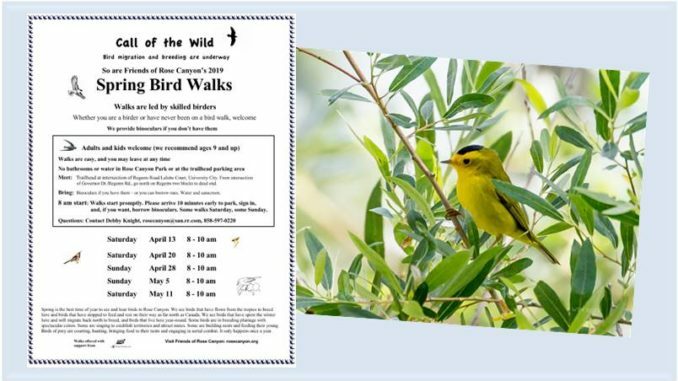 Friends of Rose Canyon invites you to Free Spring Bird Walks during the months of April and May. Bird migration and breeding are underway, and Rose Canyon is green and beautiful. Experience the amazing sights and sounds of spring birds, including some that have migrated here from the tropics. Walks are hosted by Friends of Rose Canyon and led by skilled birders. We welcome beginners and experienced birders. Binoculars are provided if you don’t have them. Both beginners and experienced birders are welcomed, and the best ages are for those ages 9 and up. Walks are easy, and participants may leave at any time during the walk. Remember there are no bathrooms or water in Rose Canyon Open Space Park. Spring is the best time of year to see and hear a great variety of birds in Rose Canyon, including migrants from the tropics, winter residents getting ready to migrate north, and year-round residents. Many are in breeding plumage, some with spectacular colors. Some are singing to establish territories and attract mates. Some are building nests, gleaning insects off the trees, feeding their young. Birds of prey are on the wing, courting, hunting, and carrying prey to their nests. Rose Canyon becomes a different world during spring bird migration. Join us to experience this dramatic annual display of nature in our midst. Photo Caption: This handsome little Wilson’s Warbler stopped over to feed on some insects in Rose Canyon during it long migration from as far south as Central America to as far north as Alaska to breed. The population of Wilson’s Warblers is in steep decline, so we love to catch sight of them during our bird walks in Rose Canyon. Photo courtesy of Bill Mittendorf.